At the time, I was in search of a way to deliver a work of art as a fruit of mere existence, instead of as a result by design. This was as though carefully putting your hands around a flame, protecting it from going out: a flame of phenomenon that suddenly lit up from a collection of subtle moments of encounters in real life. Most of the memories behind these photographs actually lie within the people around them. 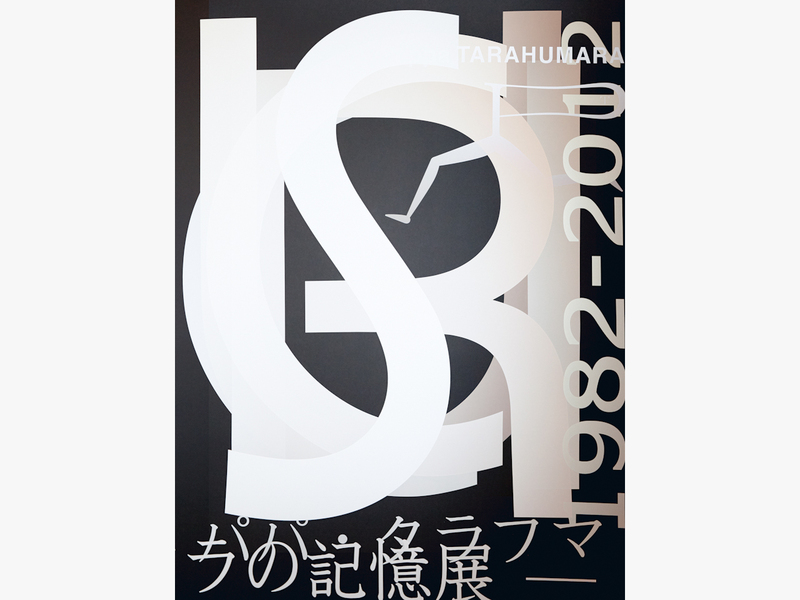 These works on Pappa TARAHUMARA, Hiroshi Koike and their friends were brought to life solely by their love and years of sublimity and loftiness. The news came one day that Pappa TARAHUMARA will indefinitely stop performing. Their final performances entitled "Final Festival" were soon to start, and May 31, 2012 was set as the date for the last day of their career. Four pieces were performed at the "festival". By the time I had finished watching "Three sisters" and "Island", the first two of the program, I found a strong feeling growing inside of me that I must stay as a witness to this show. "CIRCUS: memories of Pappa TARAHUMARA" was held at Nagareyama City Lifelong Learning Center in Chiba, Japan from April 28 until May 27, shortly following the "Final Festival". The exhibition virtually became their last performance. 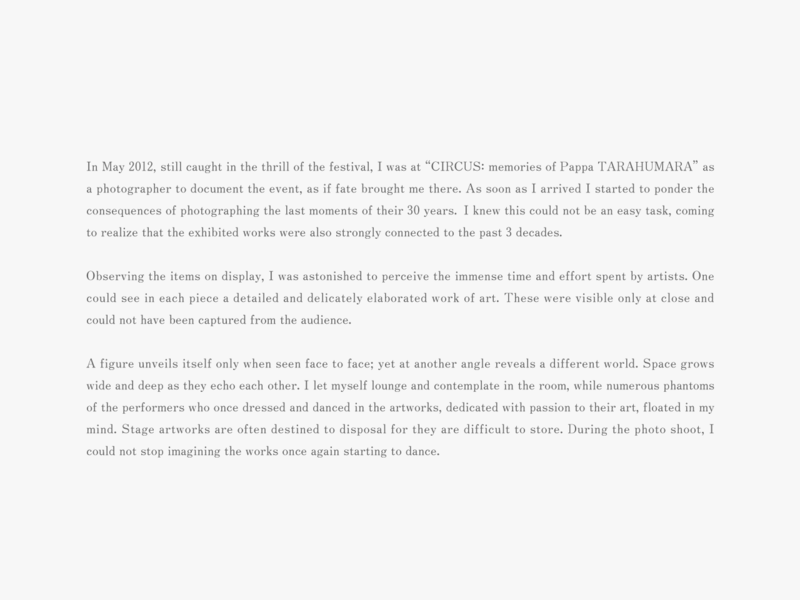 n May 2012, still caught in the thrill of the festival, I was at "CIRCUS: memories of Pappa TARAHUMARA" as a photographer to document the event, as if fate brought me there. As soon as I arrived I started to ponder the consequences of photographing the last moments of their 30 years. 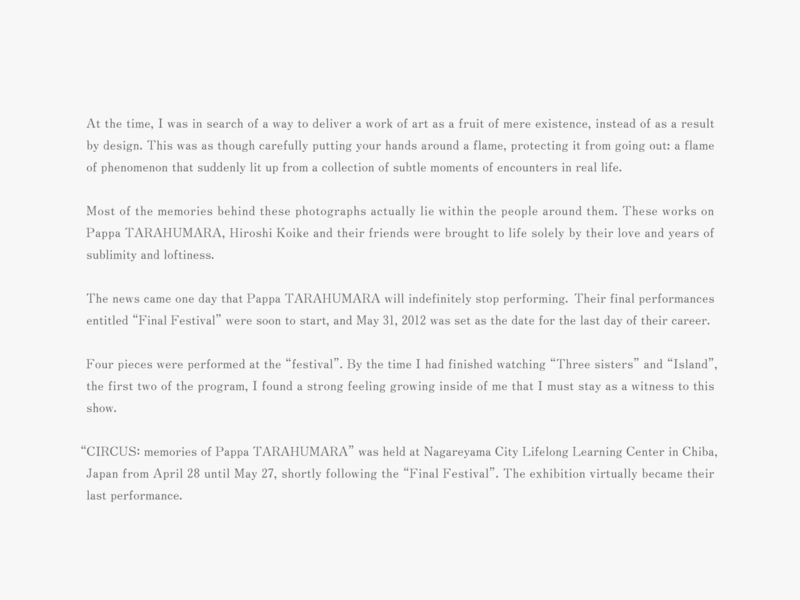 I knew this could not be an easy task, coming to realize that the exhibited works were also strongly connected to the past 3 decades. A figure unveils itself only when seen face to face; yet at another angle reveals a different world. Space grows wide and deep as they echo each other. I let myself lounge and contemplate in the room, while numerous phantoms of the performers who once dressed and danced in the artworks, dedicated with passion to their art, floated in my mind. Stage artworks are often destined to disposal for they are difficult to store. During the photo shoot, I could not stop imagining the works once again starting to dance. I wanted to give a proper farewell to Pappa TARAHUMARA and Hiroshi Koike by taking their photographs. Upon designing a way to put together the images, I was suggested an idea by Nagareyama City Lifelong Learning Center. The center belongs to ART ROUND EAST, an art consortium in eastern Tokyo, committed to dealing with artists in and around areas along JR Joban Line and Tsukuba Express. 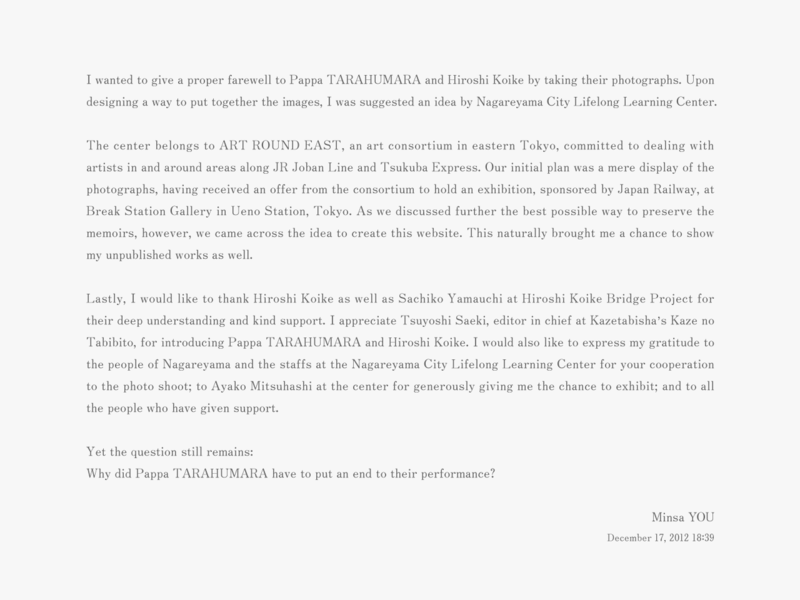 Our initial plan was a mere display of the photographs, having received an offer from the consortium to hold an exhibition, sponsored by Japan Railway, at Break Station Gallery in Ueno Station, Tokyo. As we discussed further the best possible way to preserve the memoirs, however, we came across the idea to create this website. This naturally brought me a chance to show my unpublished works as well. Lastly, I would like to thank Hiroshi Koike as well as Sachiko Yamauchi at Hiroshi Koike Bridge Project for their deep understanding and kind support. I appreciate Tsuyoshi Saeki, editor in chief at Kazetabisha's Kaze no Tabibito, for introducing Pappa TARAHUMARA and Hiroshi Koike. I would also like to express my gratitude to the people of Nagareyama and the staffs at the Nagareyama City Lifelong Learning Center for your cooperation to the photo shoot; to Ayako Mitsuhashi at the center for generously giving me the chance to exhibit; and to all the people who have given support. Why did Pappa TARAHUMARA have to put an end to their performance?